I really needed to try out my new large bobbin shuttle, so I chose a familiar pattern. This is Masquerade from Tatting with Visual Patterns by Mary Konior. I have a love/hate relationship with this pattern. Either it works up beautifully as it did this time, or I get all discombobulated and can't make it work. I'm glad it worked well this time! I used size 10 Aunt Lydia's. 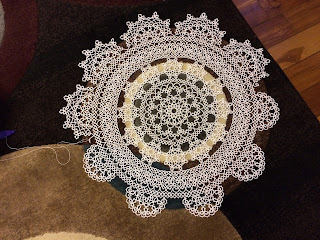 It's hard to believe that I used to consider size 10 thread to be "fine" crochet. Now it feels like rope to me! I don't mind crocheting with size 10, but I really don't like tatting with it. The shuttle worked great! I should let you know that I'm not a big fan of bobbin shuttles, although I do have quite a few in my collection. I guess because I learned to tat with post shuttle, it will always be my first love. Anyway, I was impressed with Laszlo's shuttle. I thought that the recessed screws might bother me, but they didn't. The shuttle is so smooth, the recess didn't matter at all. However, if you do not like tatting with a large shuttle, I wouldn't recommend this one. I have many tatting friends who do not like large shuttles. They don't bother me. Just so you know, the large Clover shuttle seems small after using the large bobbin shuttle. I hope that gives you a frame of reference. My newest scarf is coming along nicely. This is Morant from Sequence Knitting. I treated myself to some Madelinetosh. My friend Denise loves it for knitting socks, so I thought I'd give it a try. It's a lovely yarn! I don't usually spend this much per skein, but one skein won't break the bank! 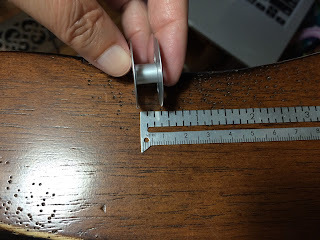 Earlier in August, Frivole posted about her interest in finding a larger bobbin style shuttle. Although bobbin shuttles are not my favorite, I felt the need to find one! I contacted several bobbin shuttle makers, and will post my findings as they're available. If you make bobbin style shuttles and I didn't contact you, please don't be offended. I'm not sure I can remember who I contacted! The first shuttles have arrived! They're from Laszlo in Budapest, Hungary. He actually contacted me on the Facebook Tatting Shuttle Addicts page when he read of my search. If you're interested in his shuttles, you can find him on Etsy (Banyek) or Facebook (Coin Smal). As you can see, this shuttle is just about 3" long. The screw holes are recessed and very smooth. The bobbin itself seems huge! The bobbin is about 1" wide. It holds 12 yards of size 10 Aunt Lydia's. Just in case there's a run on these shuttles, I ordered three! Laszlo included this nifty little screwdriver. Can you guess what my new quest is? I'm making progress on my Jan Stawasz Masterpiece. I think I will finish round 12 this week! It looked like I was getting close to finishing, so I've spent the last two days concentrating on my Enders scarf from Sequence Knitting. There was more yarn left on that ball than I thought! The finished scarf is 48" long. No, I won't be able to wrap it around my neck more than once, but it will look really sharp tucked inside the neckline of my bright red jacket! 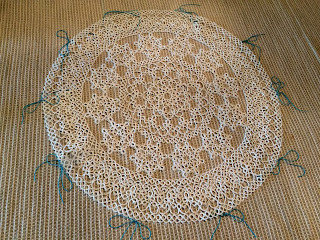 I think it gives the doily a fresh new look... or it could be that I've made it half way around! 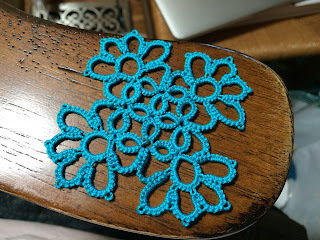 It was a busy weekend, which meant I had to slow down on my tatting. Still, I managed to finish one more section. 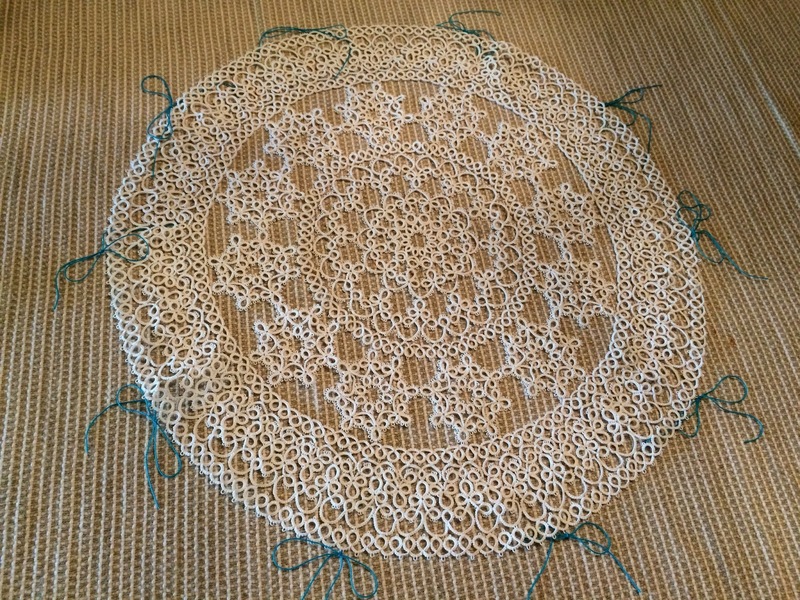 Just think... the next time I post a picture of this doily, I will be half way around! We went to daughter Alison's to help with her bathroom remodeling project. It's much easier to pick up and put down my Enders scarf from Sequence Knitting than to ask Dave to wait until I finish tatting a ring. So, I made pretty good progress on the scarf. I know some people would not like the way the darker shades pool together, but I think it looks cool. I guess that's a good thing, since I am now positive that I will keep this scarf for myself! 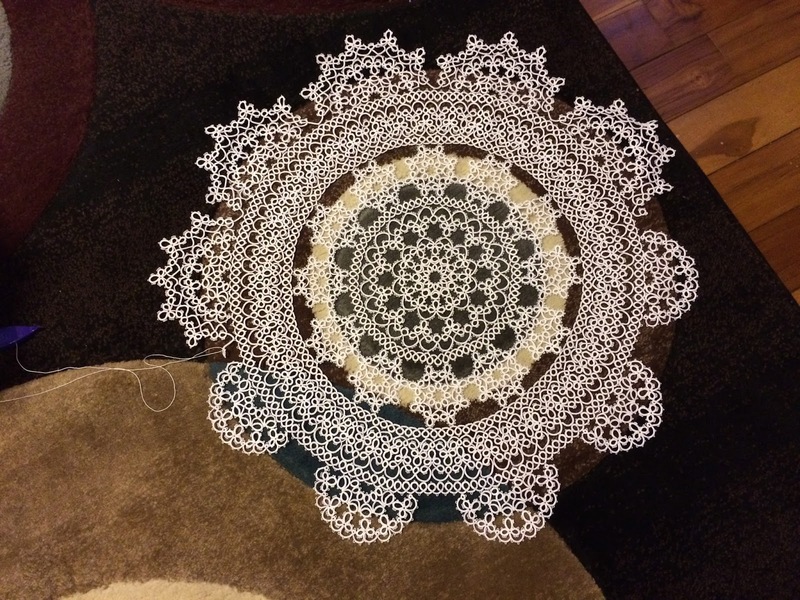 I was reading Jane's post about protecting the edge of her knitting, and I thought it was a great idea for holding the bulk of my Jan Stawasz Masterpiece while tatting. It's working out great! Thanks for the tip, Jane! Mom wanted a picture with a yard stick to show the size of my Jan Stawasz Masterpiece. Here it is, Mom! As you can see, I've managed to get around a third motif. 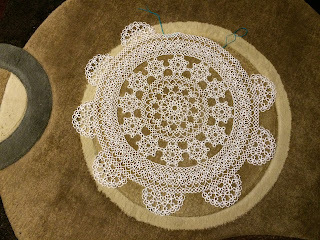 I just keep humming "High Hopes" as I'm tatting, and I'm always amazed at how much I can accomplish! Yup... just a little bit of time and I was able to finish tatting around another section! 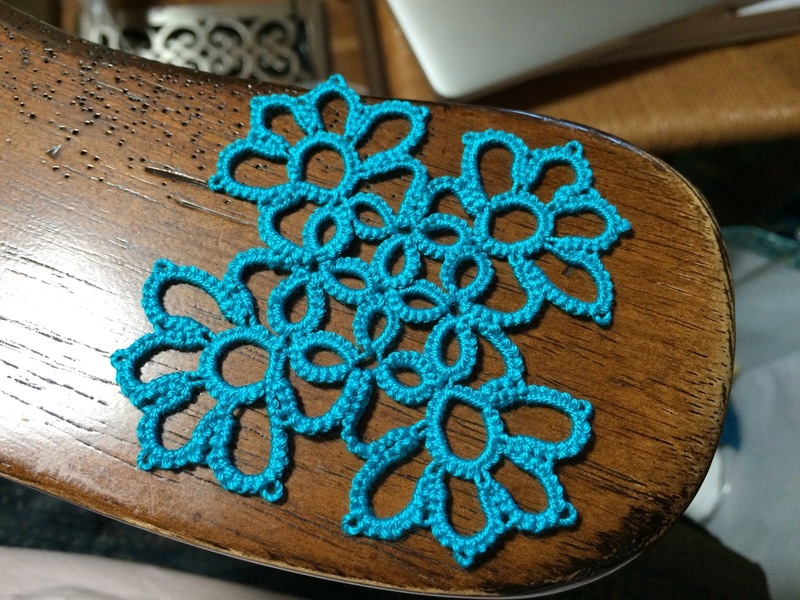 I'm sure that once I get settled into my school routine, I'll be able to carve out a little more time for tatting. However, if it doesn't work out as I've planned, I know that I can be happy with just a little bit! I only had an hour to tat today. Isn't it funny how work can get in the way of our favorite activities? I had another wonderful international mail day, starting with this beautiful coaster made by Wendy at Umi & Tsuru. I was a very lucky winner in a drawing she held recently. Thank you, Wendy! More lovely shuttles arrived from Qtat in Hungary. They are so light weight! These beauties are from Veronica in Russia. This is the fastest I've ever received a shipment from Russia... 15 days! So, even though I only had an hour to tat, it was a wonderful tatting day! We went to daughter Alison's house yesterday to help with her bathroom remodeling project. I delivered Eva's and Aidan's finished scarves. It's a little too warm for them right now, but they both loved them! The patterns are from Sequence Knitting by Cecilia Campochiaro. The pattern for Aidan's blue scarf is called Marlett. I was interested in the name, so I looked it up and learned that Marlett is a TrueType font that has been used in Microsoft Windows since Windows 95. Lyden is the pattern name for Eva's white scarf. Curiosity got to me again, and I learned that Lyden is a town in South Africa. It's also the name of an oil company. I guess it's true that we learn something new every day! While Dave was busy working in the bathroom, I worked on another dishcloth. I had read on someone's blog (I can't remember which blog) that she didn't like the eyelet edge on the dishcloths. So, instead of K2, yo, knit to the end, she follows K2, k in front and back of next stitch, knit to the end. On the decrease side she follows K2, K2 together, K to the end. It worked out well, and now I have an alternative way to knit my favorite dishcloth pattern! I started another scarf from Sequence Knitting using Preciosa Tonal "Captain" from Knit Picks. So far, I really like this yarn. The pattern name is Enders... the meaning of Enders? I found a sci-fi book by that title, but I didn't do too much research. Maybe I'll look into it further later, but for now I think I'll just knit! Well, it's been a little over a month since I had to snip my Jan Stawasz Masterpiece. You can read about it here. With only one more pattern repeat to go for rounds 10 and 11, I feel that I can relax! 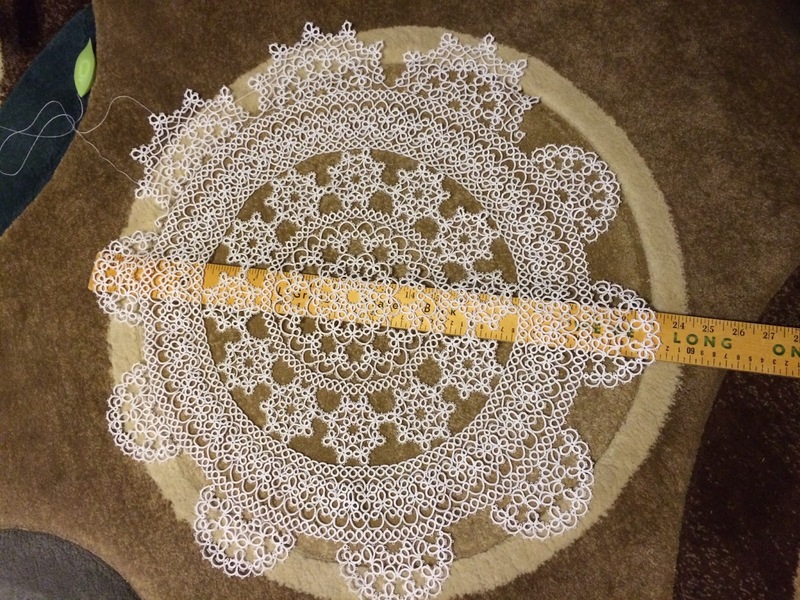 Because of all the snipping on this doily, I felt the need to purchase new scissors. Actually, that's just an excuse. My mom helped me develop a love of scissors, and when I find a pair I like, I just have to have them! I learned about these little beauties online. Was it a blog? Was it Facebook? I really can't remember. Can you see the little kangaroo in the scissors? That's what attracted me. Plus, how can one ignore the name Scissoroo? They're heavier than most of my embroidery scissors, but the blades have a fine enough tip to allow for very close snipping. I really like them! The circles on my living room rug seem to be the perfect backdrop to my Jan Stawasz Masterpiece. I have only two pattern repeats to go to finish this round! Two more beautiful shuttles arrived in the mail today. These two are from Qtat in Hungary. I love collecting shuttles from around the world. If I can't go out and see the world, I can have the world come to me! It's true! I've managed to finish 7 pattern repeats of rounds 10 and 11 on my Jan Stawasz Masterpiece. It looks like this is the last time I'll be taking a picture on the ironing board, and that's okay. I'm getting close to where I had to snip, and that makes me very happy! I'm hoping today is the last day I need to go in to set up for school. We have four new teachers in the elementary building, so I've had to change the little file cards for my library card basket. I measured incorrectly yesterday, so I need to do them over again today. I should have remembered my mom's advice: measure twice, cut once. Luckily, everything is saved on the computer, so it's just a matter of reprinting, measuring, and cutting... correctly! I have new shelf signs made for the high school/middle school library. I'll get those put up today and enter the new students into the electronic circulation system. I'm hoping to get my new class schedule today. I'd really like to have my first two weeks of lesson plans written down before we start on Monday. I saw a couple of the kids playing outside the school yesterday. They both came up to me with big smiles on their faces and we talked about our summer activities. I have to treasure these moments. This is my last year of making memories as a teacher! After spending the morning at school yesterday, I was ready for some tatting time in the afternoon. 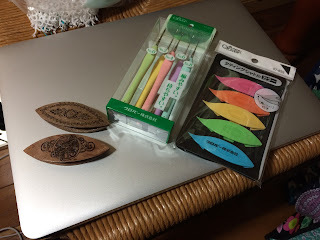 My tatting time was interrupted because of some wonderful packages in the mail! I've been eagerly awaiting this clear Clover tatting shuttle from Japan. They cost a bit more than the other Clover shuttles, but I don't mind. I really like this shuttle! I wonder if the clear plastic will ever become more readily available? I guess time will tell! I find it very hard to resist when new Pop-A-Bobbin shuttles become available in Jane's shop across the pond in England! And yes, I can and do sew, but why should I? 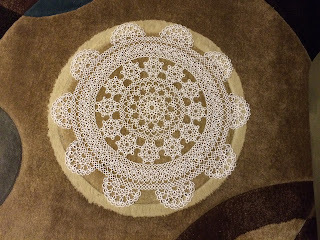 Jane makes such lovely bags, and I get to brag that I have something made by one of my tatting mentors! Veronica's lovely shuttles came all the way from Russia! I just can't help myself... I love collecting and using shuttles! Despite all the excitement of receiving goodies in the mail today, I did manage to finish another pattern repeat of rows 10 and 11 of my Jan Stawasz Masterpiece. I'm headed off to do some more work at school today, but I am hoping to stay on track and complete another repeat today! I only have one week left before school starts. Where has the summer gone? 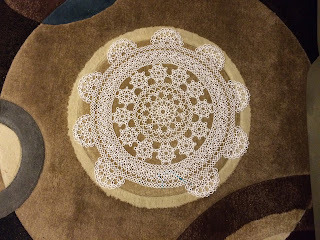 I completed one more pattern repeat of rounds 10 and 11. I know it doesn't seem like much, but each one of these takes me about 2 1/2 hours. At one medallion a day, I might be able to finish these two rounds before school starts. I'm keeping my fingers crossed that my wrist holds out! I spent a lot of time watching Agatha Christie's Poirot yesterday. I used it as my stop watch for tatting and knitting... one episode for tatting, one episode for knitting, switch laundry loads when the buzzer went off... maybe that's why my wrists feel so good today! The sun is shining brightly this morning, making it difficult to take a good picture. I completed round 9 and marked where I need to join round 10... perfect! Now I can proceed with confidence. I just can't help myself when it comes to tatting supplies, crochet hooks, knitting needles, yarn, fabric. I guess I'm hopeless! The wood shuttles are from Banyek. I love the size, weight, and design of these shuttles. If you're a regular reader of my blog, you know that I love Clover shuttles, so I decided to try their crochet hooks as well. I ordered them from handicraftjp. I've ordered from this Etsy shop before, and I'm amazed at how quickly my orders have arrived! I worked some more on Eva's scarf. I'm really enjoying the pattern, and it's working up very quickly. I hope to finish it by the weekend. Although I prefer the look of finer yarns, I enjoy the speed with which I can finish super bulky projects! I was extremely lazy yesterday and as a result, I didn't accomplish much around the house. However, I did have fun! One of my former students, Amanda, has opened a little flower and gift shop called The Still Room in Manteno, a little town about ten miles west of us. Her grand opening was Monday evening and the place was packed. I went back yesterday morning to explore a little more and purchase some of her wonderful hand-crafted soaps. It's so much fun to follow the paths students take, and Amanda is a very talented young lady. I wish her all the best in her new venture! I finished Aidan's scarf. I'm sure he will like it, because it's so thick and soft! I started a scarf for Eva, also using the Bernat Baby Blanket. I'm really enjoying exploring knitting patterns with Sequence Knitting. Yes, the patterns are mostly old, familiar ones, but the way they are presented makes so much more sense to me. I'm finding that knitting these scarves is very relaxing, because I understand the sequence of the pattern. Again, the book is probably not for everyone, but it is a wonderful book for me! I'm happy to say that I am now 3/4 of the way around on row 9 of my Jan Stawasz Masterpiece! 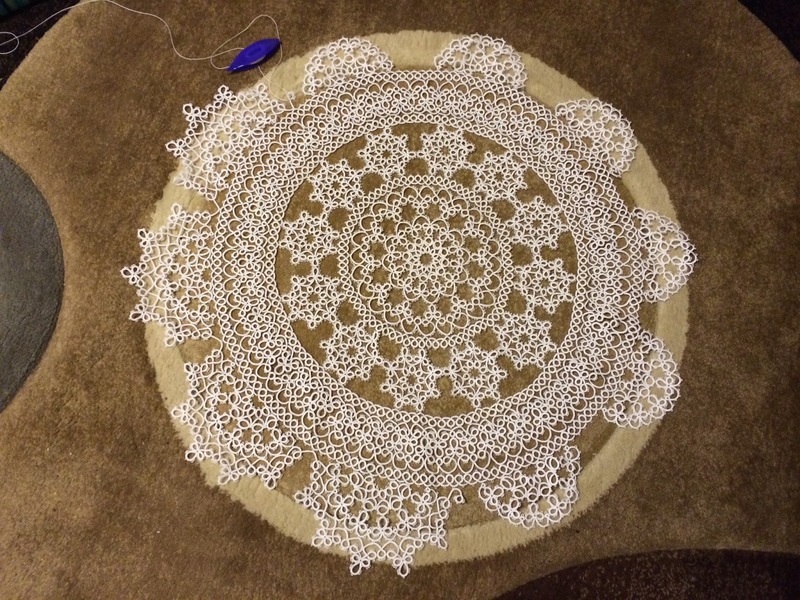 Despite my setbacks with this doily, I really am enjoying every minute I spend with it, but I really am feeling the urge to tat some smaller pieces! Well, yesterday I set up the elementary library for the last time in my teaching career. Somehow, it didn't seem like the last time. There's still plenty for me to do. Registration is Wednesday, so I should have class lists by the beginning of next week. Once I receive the lists, I'll have to set up the new students in the computer so that they can check out books. I'll also set up the computer lab, assigning students to computers for the year. My friend Kris retired last year, so I will now have the responsibility of setting up the middle/high school library as well. It's not a big deal, just rehanging signage and checking in and shelving books that were found over the summer. It's hard to believe that next year these will be someone else's responsibility! As you can see, I've passed the halfway point on round 9 of my Jan Stawasz Masterpiece. When I finish this round, I'm going to borrow a tip from other tatters and mark where the next two rounds need to be attached before actually tatting. That way I'll now ahead of time if I've made another big mistake! As many of you know, I love hand-dyed thread, and I always like to support new fiber artists. No, I don't need any thread. I'll probably have to start giving some of it away so that Dave and I can stay in our house... yes, my obsession with all things tatting can be a bit overwhelming! Anyway, AlenAleaDesign opened her Etsy shop in July, and I just had to order some of her beautiful thread. Doesn't every tatter need Australian hand-dyed thread? The two on the left are size 40 and the three on the right are size 20. I wonder what they will become? Time will tell. I had a lovely surprise in the mail yesterday. My dear friend Carol sent me this gorgeous butterfly! I had seen her blog post stating that a gift was in the mail, but I never suspected that it was flitting my way! Carol takes some beautiful pictures of art exhibits that she visits. She only lives about an hour from me, so perhaps I should take a hint from her and start taking advantage of exhibits within driving distance. I do love the beautiful note card with one of my favorite paintings, Girl with a Pearl Earring. After all, she's wearing a headband in my favorite color, and I love pearls! Thank you, Carol! One of the advantages of having a shuttle collection is that I can help others out when they have questions about some of the shuttles available. I'm not an expert, and my recall of details is often flawed, but I can show pictures. I was asked about Jan Stawasz shuttles. I do own several, and I love them! They are especially good for size 10 thread, which Mr. Stawasz preferred. I read somewhere that the shuttles are resin, but I was under the impression that they're fiberglass. I'm not an expert on these things, and I guess it really doesn't matter. They are well made and hold a lot of thread! My all-time favorite shuttles are from Grizzly Mountain Arts, especially my scrimshaw shuttles. I've had a fascination with scrimshaw since elementary school, when my friend Francine and I would sit and read mysteries for hours. One book discussed ambergris, and after my dad helped me research ambergris, I became fascinated with all things related to the northeastern states, whaling, scrimshaw, etc. I searched for years for a scrimshaw tatting shuttle, and when I found Dave Stanbrough's beauties I was thrilled! Each shuttle is an artistic masterpiece, and I feel like a master tatter whenever I use one! My go-to shuttle is the Clover, and once Clover introduced their larger shuttles, my other shuttles were relegated to the display cases. I love the feel of these shuttles. I don't mind the larger size. The hold enough thread that I don't feel like I'm rewinding my shuttles all the time, and I love the nice sharp point! Oh, I know that there of those of you who think those points are lethal, but they are my friends, and I have yet to stab myself to the point where I bleed... whew! What's your go-to shuttle?